Samsung Gear S3, the latest Tizen-powered smartwatch will be released in the US in the next two weeks. Samsung has confirmed that the product will be available from November 18 and the smartwatch goes for preorder from Sunday, November 6. The Samsung Gear S3 will be available from Samsung, Amazon, Best Buy and Macy's in the US. The LTE variant of Gear S3 will be available from AT&T, Verizon and T-Mobile but the pricing for these variants is yet to be announced. Samsung Gear S3 was announced almost two months back as the mainstream device at IFA 2016. The Gear S3 follows the legacy of Gear S2 with refinements and improvements in terms of reliability. Samsung Gear S3 features a design similar to Gear S2 but the new watch is considerably bigger and thicker than its predecessor. Samsung Gear S3 will be available in three variants - Classic and Frontier - and they won't appeal to smartwatch nerds with tiny wrist. Samsung Gear S3 adds new features like onboard GPS, magnetic payments and a bigger display. Samsung Gear S3 features a 46mm case with a thickness of 12.9mm. The screen on the Gear S3 is now 1.3-inches with the same resolution of 360 x 360 seen on the Gear S2. Samsung Gear S3 also supports always-on display. 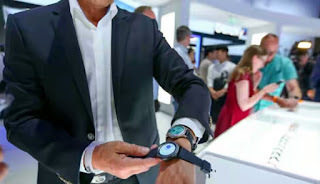 Samsung says Gear S3 should last three to four days on a single charge - which isn't bad for a smartwatch with onboard GPS and LTE connectivity. Samsung has also added a 'watch only' mode which shuts all the radios and smartwatch functionality to make Gear S2 a completely standalone watch. Samsung Gear S3 Classic features stainless steel build while the Frontier sports a matte black finish. Samsung will only offer the Frontier varint with LTE connectivity. The Gear S3 also brings improvement to Tizen platform with additional function to rotary dial. Samsung had launched its Gear S2 in India soon after its global availability so expect this Tizen-powered smartwatch hitting Indian market soon.